The Garden City Comprehensive plan serves as a model for comprehensive planning. A broad cross section of Garden City residents and business interests participated in developing the plan. Their support was unanimous for a bold new vision for Garden City that uses the city’s location in the heart of the Treasure Valley , adjacent to the Boise River , and situated along two major transportation corridors to its advantage. The steering committee was adamant that this plan not collect dust, but be implemented to guide future actions of the city. The Eleven goals of the plan advocate for smart growth, and include 135 action steps. The Council will review it’s implementation status every 6 months. Valley Advocates for Responsible Development (VARD) is a local, citizen-based non-profit that advocates for smart, responsible development that promotes vibrant communities, preserves the landscapes they love and is cost-effective to taxpayers. Founded in 2001 by citizens concerned over the water quality impacts of a proposed development in a wetland, it is dedicated to responsible development and sustainable use of the natural resources (water, land, wildlife and air) in Teton Valley , Idaho . We recognize VARD for its leadership in updating the City of Driggs Comprehensive Plan . 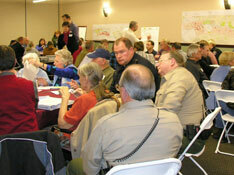 VARD helped guide a charrette (planning workshop) process and sponsored several public meetings. The actions of its five staff members and many volunteers lead to a much better final product. VARD also played a vital role in securing a Smart Growth Implementation and Technical Assistance Grant for the whole Teton Valley . A charrette was conducted by a team of nationally prominent smart growth practitioners in the fall of 2006 to review the growth management strategies in Victor and Driggs and the county. Recommendations from that process will be reviewed for implementation. This project was built around the idea that good development is dependent upon smart growth principles and that mixed use projects make for a seamless, old fashioned and neighborly living experience. Winding Creek is an excellent blend of retail and professional spaces with a variety of residential options. Its location takes advantage of existing infrastructure rather than extending it on the fringe and promotes pedestrian and bicycle activity. It infuses office and retail space into downtown Eagle and offers attractive in-town residential options, bucking the urban sprawl trend. Winding Creek takes advantage of the natural and man-made challenges of the land, using the frontage on State Street (Eagle’s Main Street ) for retail/commercial space while using the waterway as an amenity. Housing is reminiscent of an older city block with narrow lots and new urban design. Single family dwellings are built close together, with garages facing alleys and front yards merging into common open spaces. It incorporates pocket parks, a shared garden, toddler play area and a putting green. A separate adjacent multi-family development adds to the mix of housing types within walking distance. Winding Creek is a desirable addition to the mix of developments in Eagle and will add to the city’s ability to support bus transit in the future. An excellent example of smart infill, this project aims to transform the former site of a Garden City meatpacking plant. The mixed use development of single-family, townhouse, and condominium residential choices, for buyers in a range of incomes, creates vitality and population density to support existing infrastructure. The Waterfront District is a large enough community to invite and support additional redevelopment of surrounding land and infrastructure. Just 5 minutes from downtown Boise , the project will bring its residents closer to the urban core, shortening commutes, reducing pollution, and encouraging use of mass transit. The Waterfront District anticipates and takes advantage of other nearby redevelopment projects. It protects 2 acres of green space along the Boise River and provides new public access to the Greenbelt near a planned bike and foot bridge to the Esther Simplot Park that is under development. Other amenities include a community clubhouse, pool, private beach, and access to a planned whitewater park on the river. 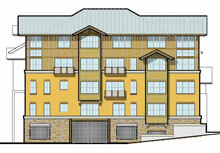 Mountainside Village is a mixed residential development (primarily different types of single family) in Victor, Idaho. The parcel was annexed as part of the approval process. It includes 10 different housing types, and 40% of project site is set aside as protected open space. The development features a linear pathway system connecting residential with adjacent commercial and community uses. An organic Community Supported Agriculture (CSA) farm currently on the site will remain. All homes within the development must be built to meet LEED-H standards. Bio-swales are also incorporated to manage the storm water on site. The project will fund the Mountainside Institute to promote the arts,culture, and smart growth principles through educational programs. The funding for the Institute comes from a 1% premium on lot sales. This building is a prime example of smart growth. Built on an underutilized former gas station site in downtown Boise , the building supports the urban fabric of the city. The Veltex Building has retail opportunities at the pedestrian level, with commercial space and residential living above it. Veltex creates a great retail, working and living environment for its occupants and promotes urban density. 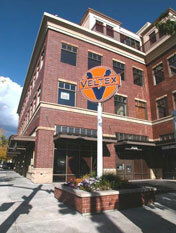 The Veltex Building acknowledges and respects its context with a corner plaza that honors the former gas station with its name and renovated neon sign. The brick and stone finishes echo the historic surroundings. The building was awarded an Orchid Award from Preservation Idaho for Preservation-Sensitive New Construction and has received praise for helping to strengthen Historic Old Boise. The Veltex building includes many of the smart growth attributes listed on our smart growth commercial scorecard. Among them are ‘green’ elements; a Geothermal Heat Exchange System, low E glazing, canopies for shading devices, recycled carpets and renewal floor coverings. The City of Moscow made a commitment to protecting the environment, improving quality of life, and promoting sustainability. The city adopted a program to actively facilitate green building by offering local contractors and owner/builders the option of certifying their residential projects as “Green” to help the city fulfill this commitment to sustainability. Project certification is assessed using the National Association of Home Builders Green Building Checklist or optionally The Leadership in Energy and Environmental Design (LEED) Green Building Rating System for Homes. Green Building is a whole systems approach to the design, construction, and operation of buildings to reduce energy use and pollutants from the early stages of development through the final finishes. The program will benefit builders, homeowners and the community by reducing resource consumption and improving livability. This proactive approach to fulfilling the city’s mission is a model for other cities in the state. Recognizing outstanding leadership in building design, environmental stewardship and energy efficiency. The Banner Bank Building , in the heart of downtown Boise , is constructed with over 40 percent recycled content materials and has been recognized with a Leadership in Energy and Environmental Design (LEED) Platinum rating from the U.S. Green Building Council. This highest rating distinction sets the Banner Bank Building among an elite group of office buildings all over the world. The Banner Bank Building has become a benchmark for sustainable design, construction and operation. Using an integrated design approach and the LEED Rating System as a central organizational tool yielded impressive returns. Reduced operating costs contribute $1.47 million in asset value and 32.4% return on investment at a cost of $128 per square foot. The huge operational savings enable the owner to charge rents comparable to 20-30 year old buildings and still make a healthy profit – making both owner and tenant happy. The building integrates a host of sustainable design strategies. A transit friendly location, ‘smart’ lighting control, underfloor air vents and geothermal heat all contribute to a 60% reduction in energy use over typical construction. A revolutionary storm water and gray water recycling system uses 60-80% less water than usual. All indoor finish materials have low or no volatile organic compounds, and alternatives to automobile commuting are promoted with indoor bicycle storage and individual shower rooms. The environmentally friendly design provides greater comfort to occupants and enhanced value to the building owner proving that high-performance buildings are good business.